Spotify is no longer available in VDJ 8?! On Sep. 8th, 2017, Virtual DJ announced a major change in their music streaming capabilities – a complete removal of Spotify from the streaming library options: Spotify is currently no longer available in VDJ 8 as they have recently changed their terms in regards to using Spotify inside Professional DJ applications. We are in discussions with Spotify in order to restore and improve the service but currently no ETA can be provided. By now, it seems that Spotify has proven not to be ideal for DJ use. Of course not! 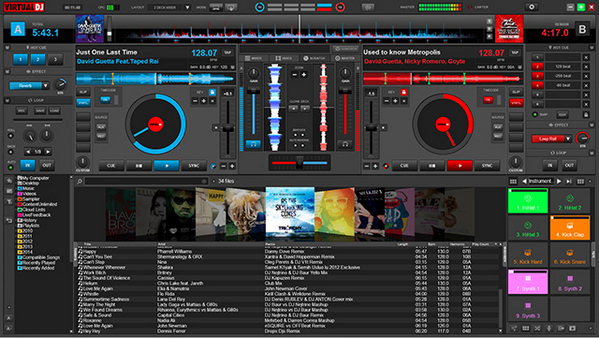 This article is going to show you how to add Spotify songs to Virtual DJ software with an exclusive method. Virtual DJ 8 is now not licensed for streaming Spotify. To import Spotify songs to VDJ, we will have to download Spotify music to our local computer first. But as we all know, all the songs on Spotify are protected in DRM, a typical feature for streaming music service, thus we are unable to do that in a regular way. BUT, a Spotify music converter will help you perfectly do that job. Next comes the details. There are all kinds of Spotify music converters in the market. It’s advised to choose the program with more stable performance and lifelong free updates and technical support. By comparison, here we choose NoteBurner Spotify Music Converter as an example. NoteBurner Spotify Music Converter is a professional Spotify DRM removal tool that can convert Spotify songs to DRM-free formats (MP3, AAC, FLAC or WAV), by which you can easily download music from Spotify to your local PC and Mac. Convert Spotify songs MP3, AAC, WAV, FLAC format. Easily download music from Spotify to local computer. Support one-click to burn Spotify music to CD. Support sharing Spotify music with others via e-mail. The following is a step-by-step tutorial on how to add Spotify songs to VDJ Software: 1) Convert Spotify songs to a DRM-free format; 2) Import converted Spotify songs to VDJ. Click button on the upper left or click the center of NoteBurner. There will be a pop-up window prompting you to copy and paste the playlist link from Spotify to collect your songs to the converter. Click button "Settings" on the upper right. Here you can choose the output format (MP3, AAC, FLAC, WAV), output quality (High 320kbps, Medium 256kbps, Low 128kbps) as well as the output path. Click button "Convert" and soon you will get your Spotify songs in the DRM-free format that you selected in Step 3, which can be found by clicking the "History" button on the upper right or directly going to the output folder that you set in previous step. Now that we’ve got unprotected Spotify songs on our computer, we can easily add the songs to the deck of VDJ: 1) Launch Virtual DJ; 2) Find the browser pane at the left bottom of the utility; 3) Find the folder that saves the converted Spotify songs; 4) Drag and drop the music file from the browser pane's center column directly onto the virtual turntable of your choosing to upload your Spotify songs to Virtual DJ. Note: The free trial version of NoteBurner Spotify Music Converter is limited to convert the first 3 minutes of each song. You can buy the full version to unlock the limitation.